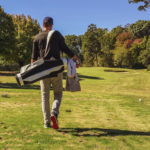 When I first came up with the idea for Golf & Entrepreneurship Magazine, interviewing someone like Nik Bando, Founder of the Bogeybox Golf Club, is what I had in my mind. He is a true Golf Entrepreneur. 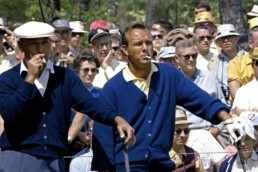 Nik personifies everything there is in golf and entrepreneurship. His journey is filled with hustle, vision, creativity, and innovation. Nik represents a new generation of entrepreneurs who know how to use technology and social media to push a product. Nik has a way of seeing oncoming trends in technology and social media before they become the norm. He started to cultivate this mindset during his time at Virginia Tech. He began his entrepreneurial journey working for the student newspaper in sales. He was going door to door to local businesses selling ad space. After a little while, he was starting to realize that businesses did not have a growing interest in purchasing ad space. There was one exception, though. He was selling advertisements with ease for the Friday edition of the paper. It was the Hokie football edition, and local businesses were eating it up. He also realized that on the flip side of the coin, students were not picking up the paper. Simultaneously, they were becoming fascinated with Facebook, as it was still only a few years old and continuously growing at the time. Nik would be in class and see that everyone was on Facebook, and no one seemed to have the student newspaper. Intuitively, Nik began to connect the dots, realizing that local businesses, bars, restaurants, etc., would rather advertise on a platform, like Facebook, that all students were using on a very consistent basis. Seeing this change in landscape, Nik started a Facebook group called, “The Extra Point.” Its sole dedication was all things Virgina Tech football. The Extra Point became a hit on campus. It was a group where people could talk about the season, share content, and read articles written about the team. It evolved incredibly quick, eventually leading to the creation of its very own print publication. In the Podcast Nik talks about the valuable lessons he learned from his first entrepreneurial venture. 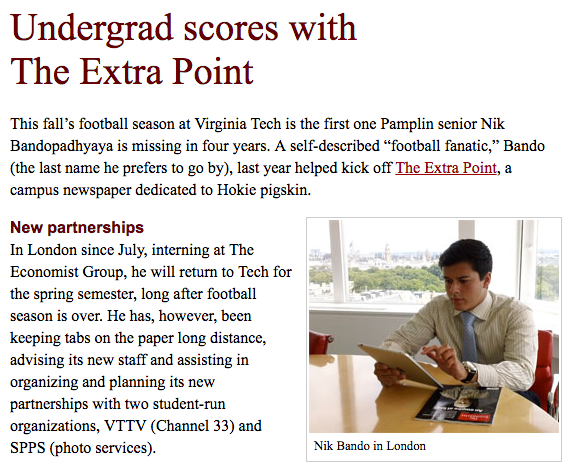 After Nik’s success with The Extra Point, he graduated from Virginia Tech in 2011 and went to work for The Economist in London. After talking to Nik, you can tell he has a very opportunistic mindset. Seeing this “title wave” shift towards a digital-centric media landscape, he decided to pivot and take his career in a different direction. Nik jumped on the opportunity to work at Vayner Media, which was founded by Gary Vaynerchuck, the serial entrepreneur, CEO, investor, author, public speaker, and internet personality. While a Vayner Media, Nik talks in detail about his career-changing experience with the agency. He was able to work with clients such as NFL.com and Zappos, to name a few, helping 10x their advertising investments through Facebook adds. He was able to learn how to use Facebook to shy away from the traditional spray and pray advertising techniques and used analytics to send the advertisement to a highly targeted audience. Make sure to listen to the Podcast to hear Nik talk about his amazing experience with NFL.com and how he was able to innovate his dream clients Fantasy Football advertising campaign. Gary took note of Nik’s marketing technique and began to wonder how he could apply it to businesses that he had invested in. This gave Nik the incredible opportunity to help out multiple startups and learn an immense amount in the process. Also during his time at Vayner Media, he assisted Gary in writing one of his best-sellings books, “Jab, Jab, Jab, Right Hook” which focused on social media marketing strategies and tactics. Nik explained how grateful he was to have Gary as a mentor, and friend. I myself could not think of anyone better to look up to for advice in this entrepreneurial era. See the video below to hear Gary talk about Nik and Bogeybox Golf Club in one of his keynote speeches. As you can tell, Nik had built up quite the skill set by this point in his career and seemed poised to venture out on his own. Just as he saw a transition in media consumption, he began to notice a shift in the landscape of retail. Amazon was dominating, and it was becoming remarkably easy to get products delivered to your door. Nik has a great way of explaining how to spot trends and get ahead of them. This strategy is exactly what he did with Bogeybox Golf Club. Nik saw that the retail industry was changing towards prescription-type boxes. 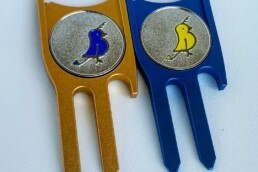 Couple that observation, with an obsession with golf, and Bogeybox Golf Club is the result. From here Nik embodied hustle. He continued to work his day job while building Bogeybox from scratch. He started building a website, learned how to process payments, and developed process procedures to build the business. All the while, he knew that he had a great skill in his back pocket. Nik knew how to drive an immense amount of traffic via Facebook to a targeted audience. In his first year of building his business, it was not uncommon for him to sleep three hours a night. He drove 40,000 dollars in online sales in his first month and had to figure out a way to get all of those Bogeyboxes to his newfound customers. On nights and weekends, he would hire his friends to help him pack thousands of boxes in the Vayner Media headquarters. Nik would then proceed to wake up and get to USPS before he started work to ship his product. Now, Nik has a team of seven as his business continues to grow. This past year, Bogeybox Golf Club drove $180k in online clothing sales, with a 92% repeat order rate. Customers are clearly enjoying the product, as Nik makes his best effort to revolutionize the shopping experience for golfers. Listen to the Podcast to hear more from Nik about his inspirational story. He is a man that is full of superb energy and talks in great depth about his journey and the lessons learned along the way.